At some point we all ask ourselves: “Okay, I’m playing the same notes as this guitar player, BUT WHY DOES HE SOUND SO MUCH BETTER THAN ME? !” Well, most people I think would assume that he sounds better because of all his expensive equipment, but the truth is, the reason why he sounds better is probably because of his superior vibrato technique. I am sure you have heard the phrase “the tone is in the fingers” right? Well that is what we are going over here. Vibrato is the art of pulsating the pitch of a note to make it sound more dramatic. In guitar terms, that would be bending the note back in forth in order to make it sound more expressive. So why is this important? Simply put, most guitar players do not understand the importance of having a good vibrato. I have seen tons of players that can sweep up and down the neck, but when they bend that last note at the end, it sounds like a cat dying. You want to be in control of your instrument because you want to sound GOOD. 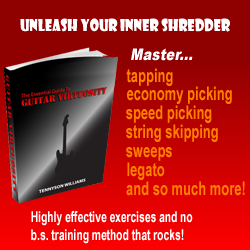 No matter how fast you can shred, if you cannot make that last note scream, you are not in control. If you do not have control of the notes, no matter how insane your chops are, your playing will still come across as “amateur-ish.” Having a good vibrato technique is what separates good players from the great players. Before we go further, lets examine some of the technical aspects of performing vibrato. Many people have asked me which direction you should bend the strings. Generally you’ll want to bend the string ‘down’ (toward the floor) on the low E, A, and D strings, and to bend the string ‘up’ (away from the floor) on the B and high e strings. The G string you would bend either direction depending on the playing situation. The reason why you’d want to bend the B and high e strings ‘up’ is because you won’t have to worry about pulling the strings off of the fretboard. Another thing to keep in mind, is that the vibrato motion should be done with the wrist, not the fingers. This will give you more control of the motion. Another commonly asked question is how far should you bend the note during vibrato. Up until I was first asked this I never really though about this, I just let my ears guide me. After close examination though, I have generally found that most the time I bend the notes a half step. However, you will want to vary the pitch and speed of the vibrato depending on how you want your phrases to speak. For example, if you want to show a lot of aggression and intensity you could do a full-step vibrato (or in some cases maybe even more). If you’re playing a slow melodic passage, you may want to use ¼ vibrato on some notes. I would recommend listening to other players with a good vibrato while paying careful attention to the nuances of their technique. Now let’s look at the right way to do vibrato, and the ways people do it wrong. I have found that vibrato sounds best when it is done slow and wide, especially if you’re into rock and metal music. (Get a vibrato example here) The most common error players make when performing vibrato is that they do it way to narrow, and way to fast. When people do vibrato that way it sounds incredibly annoying. You don’t want weak, wimpy sounding vibrato, you want to be able to blow people away with one note from a mile away. Some less experienced players may not be able to notice the difference as much, but more advanced players definitely will. Also, when you’re bending a note, make sure you bend it at an even pitch and an even rate. On top of that, you need make sure to return to the original pitch of the note after each bend, or else it will sound out of tune. This can be especially difficult when performing Bend-Vibratos (That is when you bend the note, say a full step, and then apply vibrato with the note still bent), but with enough practice and dedication, it will become second nature. Click here to get a free expanded vibrato lesson with audio examples and more information on improving your vibrato and string bending skills.